Do you get skin rashes that make your skin turning red when you wear a metal earring? If yes, then you have a problem that is associated with nickel jewelry. In an ordinary sense, such kinds of experiences are referred to as dermal allergies. Depending with the victim, it turns the skin red, crusty, dry with itchy hives or can result in eczema reactions and watery blisters. 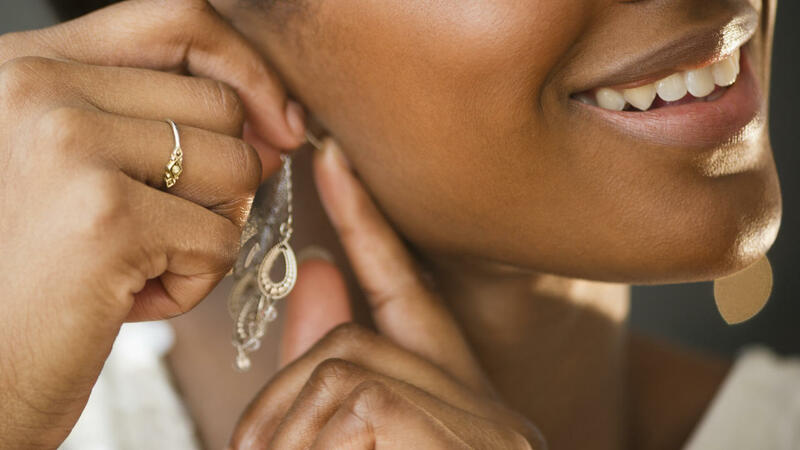 When most women who are lovers of earrings face such problems, they wonder if the decision is to abandon putting on earring forever or seek dermatologist attention. This is the reason we have decided in this article to take you through on what to do if you are allergic to metal earring so that you can avoid those allergies. Nickel, which in most cases is used to manufacture metal jewelry, is found in almost every day items. It is in coins, car bodies, keys, clothing buttons, belts among other home features, so chances of avoiding it are almost infinitive. Before we have a look at what to do once you face such a problem, let us look at how these allergic reactions come about. Surprisingly the mainstream causes of this reaction are not well known. A metal earring can be allergic to you but non-allergic to another person. This fact makes us conclude that allergic reaction depends on the skin type. The Nickel used to form metal jewelry triggers an allergic effect once it encounters your dermis hence the reactions. The simplest and sure way to avoid these reactions onto your skin is permanently refraining from putting on metal earring. As that is not enough, you will also need to avoid cloths and belts that have metals that contain Nickel. These facts are easier said than they are done. So follow the guideline below to get tutorials on what to do once in such scenario. Seek alternative earring that is nickel free. These alternatives are alloys like white gold that is based on palladium and silver. Palladium earrings are however quite expensive than nickel earring hence you need to invest more in them. White gold alloy is more resistant to corrosion than it is either in pure silver and silver sterling. This means you need to avoid cheap earrings. When having your ears pierced, have it done using a stainless steel needle and make sure the jewelry that you put is pure stainless steel or is pure karat gold. If you must put on Nickel metal earring, which causes allergies to your skin, make sure you cover it with a plastic backing that helps avoid skin contact. When you go buying your earring, buy hypoallergenic earrings. These are earrings made of polycarbonate plastic, at least 18- karat gold, or sterling silver. Before putting on the earrings, treat the pre-exposure part of your skin most commonly the earlobe with prescription cortisone cream. You need to repeat this treatment after every three to four hours. When you do that repeatedly, your body develops resistance to allergic effects temporally. Once you need to wear your earrings, clean them using hot water. Dip them inside boiled water for about two minutes then wrap them dry. When you do that, you kill any microorganisms attached on the earring making them safe. Scientist advises that it is good to first paint earring with clear nail polish at the point where the earring encounters the ear part. The nail polish acts as a cover to protect your skin from contact with the nickel metal hence no chance of getting the allergic effects. The more you stay with your earrings on the more chance of you getting allergic reactions. Therefore, if you are a victim of allergic reaction you need to take those earrings off immediately you are done with the occasion you had been attending. Before you put on your earring, it is proper first to moisten the area you are about to wear them. This mostly involves smearing the area with petroleum jelly that helps acts as a protective barrier. Lastly, once you realize you suffer from allergies of metal earring, you need to test your earring first for the presence of nickel before putting wearing them on. You can buy the dimethylglyoxime spot test in any chemist that helps detect traces of nickel in any jewelry. That way it places you in a better position to protect yourself from exposure to the allergic metal. For you to test for the presence of nickel compound, put at least two drops of dimethylglyoxime on cotton wool and rub it firmly on the earring for about ten seconds. If the stud contains nickel, the swab on the cotton turns pink. We hope that you do not intend to stop using earring very soon even if you suffer from an allergic reaction. As we have discussed, there are different methods you can follow to help you cope with these reactions and continue enjoying the beauty of earrings. Make your choice today to either using the above techniques to prevent your skin from contact with an allergy-triggering stud or buy earrings that will not affect you.